Today I found out the difference between a coffin and a casket. The words coffin and casket are often used interchangeably to describe a box used to bury a dead body in. Although the general purpose of each is the same, there are small differences between the two. The term coffin has been used to describe a container that holds dead bodies for burial since the early 16th century. The shape of a coffin typically resembles the shape of a body and has six or eight sides. It is wider at the top for the shoulders and gradually decreases in width toward the opposite end where the feet are placed (picture Dracula’s spider web covered coffin in all the scary movies). Depending on all the bells and whistles a person chooses to adorn a coffin with, the hexagonal or octagonal shape is considered to save wood for construction and can be cheaper than a casket. On the other hand, the word casket was originally used to describe a box used to store jewelry and other small valuable items before coming to have an additional meaning somewhat synonymous with coffin around the mid-19th century. A casket is typically a four-sided rectangular box and, when used for burying people, often contains a split-lid for viewing purposes. Interestingly, it is thought that the word casket was adopted as a substitute word for coffin because it was deemed less offensive, especially when morticians and undertakers started operating funeral parlors instead of mortuaries. In addition, the shape of a casket was thought to be less dismal because it did not depict the shape of a dead body. 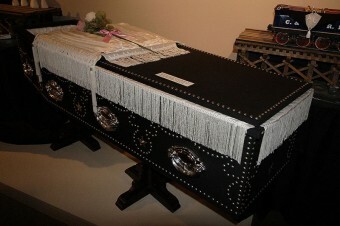 Given that they both are essentially just boxes and that both coffins and caskets can be customized in a variety of ways, include things such as jewels, engravings, pockets to hold pictures and trinkets for the deceased, and any other specialized details, the main difference between a coffin and a casket is essentially just the shape. Although, a casket may still refer to a jewelry box or the like and need not necessarily be referring to a box to bury a body in. When a coffin is used to transport a deceased person, it can also be called a pall, a term that also refers to the cloth used to cover a coffin. Coffins/caskets can cost up to $50,000 or more, depending on the bells and whistles a person wants to include. The external material from which the coffin or casket is constructed from, the workmanship, and the interior fabric are the main factors that influence the price. Coffins are most often made from wood or metal, and the quality of the material impacts the price. In addition, coffins can be inscribed with the name of the deceased or with messages from their friends and family. They can also be decorated with jewels or artwork and include internal pockets to hold personal items. Each detail increases the overall price of the casket. While most coffins are made of wood or metal, they can also be made of other materials such as fiberglass. Some even include a glass cover which enables permanent viewing of the body. In the attempt to “go green”, recently more people have been interested in making coffins of natural materials such as bamboo or Banana leaf. The idea of the environmental-friendly bamboo coffin originated in China. In 2000, casket sales reached their peak, only to experience a continuing decline since then, especially during the down-turned economy. People looking to save either sacrifice the bells and whistles of a high end casket or coffin, or choose to forgo a traditional burial in favor of cremation. Either way, in the past ten years, fewer and cheaper coffins have been sold and sales continue to decline, forcing casket and coffin makers to expand business into other areas. The external details of a coffin, which may include handles, designs, crosses, symbols, etc. are called “fittings” or “coffin furniture”. The use and design of fabric on the inside of the coffin is called trimming the coffin. You fail to put a caption on the coffin/casket with the article. It’s a reproduction of the casket Abraham Lincoln were taken from Washington, DC to Illinois in following his murder. I like the old coffins better. Better style and they looked more final. I would like to be buried in a black coffin with red trim with something old carved on top. I’m different in life, so I want to go out differently. The word “casket” is a more recently supplanted term for the once pervasive COFFIN. The shape of the container is irrelevant. The proper term for all is coffin, irrespective of shape. A casket is simply a small ornamental box or chest for holding jewels, letters, or other valuable objects. The shape of the container does have a part in what it’s called. Coffins are body-shaped. Caskets are rectangular.